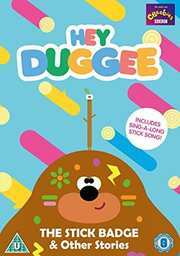 myReviewer.com - About the DVD - Hey Duggee: The Stick Badge and Other Exciting Stories! Get set for an eighth collection filled with laughter, learning and exciting activities in the adventure club that every child will want to join! Meet Duggee, a big lovable dog who is the leader of an after school club, called the Squirrels. Under the patient guidance of Duggee, the Squirrels discover new things about the world around them and their comic adventures encourage young viewers to actively solve a problem by moving, jumping, running and skipping. THE STICK BADGE & OTHER EXCITING STORIES!